Vernon (Вернон) — живописный городок, расположенный в 69 км на северо-запад от Парижа. Explore the historical district of Vernon on the banks of the river Seine with its gothic church, fine arts museum, 12th century castles and the famous old mill. Dream of past times in the exquisite chateau de Bizy.Vernon has 26000 inhabitants and lots of lovely shops, little cafés and restaurants. Как добраться на машине в Вернон (расстояние, время в пути, стоимость платных дорог, парковки). Из Парижа: Autoroute A13 : sorties 14 à Bonnières ou 16 à Douains. Из Парижа в Вернон: на поезде с вокзала Paris Gare St-Lazare (платформы справа — SNCF — Grandes Lignes) до Vernon (ветка Paris / Rouen / Le Havre, ок. 45 минут в пути). The building of the church Notre-Dame of Vernon started in the 11th century but was completed in the 17th century only. The style is mostly gothic. The elegant narrow nave is lit by a beautiful set of contemporarystained-glass windows and a few ancient ones. The church was dedicated in 1072 «to the Holy Mother of God», this is why it is named Notre-Dame (Our Lady). Saint Adjutor is the patron of Vernon. 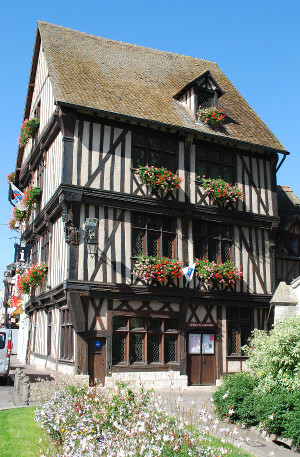 This beautiful half-timbered mansion now houses the Tourist Information Office. It is one of the oldest houses in Vernon (15th century). Its first owners built it on the main street next to the church, a very good location that led it to become an inn. Don’t miss the delicate carved corner post on the theme of the Annunciation. It was built at the end of the 19th century in the impressive neo-classical style of the time on a newly created square. The city hall faces the collegiate church. The mayor who erected it took care to raise the bell tower higher than the church, because of the rivalry between religious and civil power at that time. On the back, a fine stained-glass window features the king Saint-Louis receiving three bunches of watercress upon his arrival in Vernon. The town’s coat of arm has its origin in this story. The gallery of impressionist paintings displays two masterpieces by Claude Monet and works by American artists of the colony of Giverny. The museum also specializes in animal art, and more. The tower is a remain of the ancient castle of Vernon. 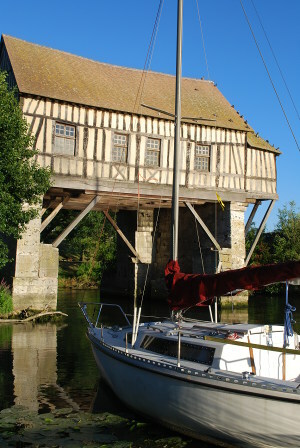 It dates back to Philippe Augustus (12th century). 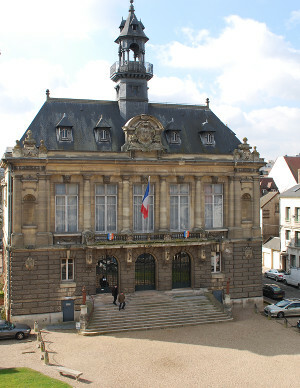 In the 19th century, it was used to keep the city archives. Exceptionnally open on Heritage Days the third week-end of September, it offers breathtaking views from the top, accessible by a 100-step staircase. 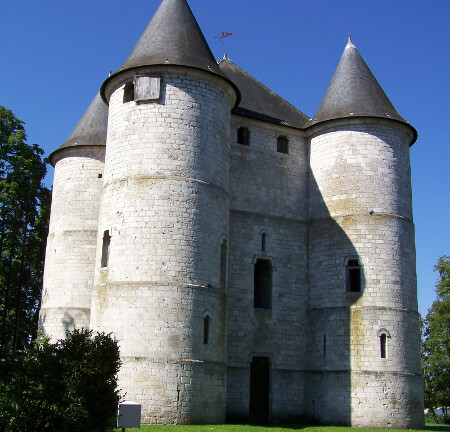 The Tourelles (turrets) castle was built in 1196 by Philippe Augustus. 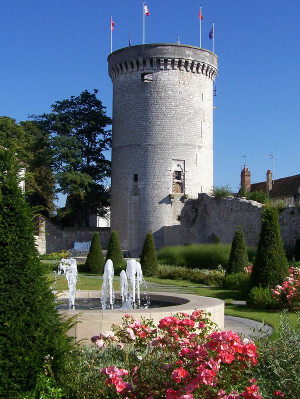 It was a bridgehead meant to defend the town of Vernon located on the border of the crown lands and the Duchy of Normandy.This stronghold consists of four towers and a keep. Outside visit only. 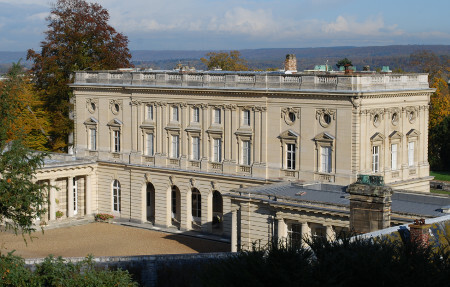 This little gem is surrounded by a large park and was nicknamed a «little Versailles» because of its fountains. The chateau de Bizy stands on the hill one mile away from downtown Vernon. It is privately owned and furnished. The guided tour includes Grand Salon, office and dining room. In spite of the bombardment of 1940-44 that damaged the town center, Vernon has kept streets that seem to come straight out of the Middle Ages. 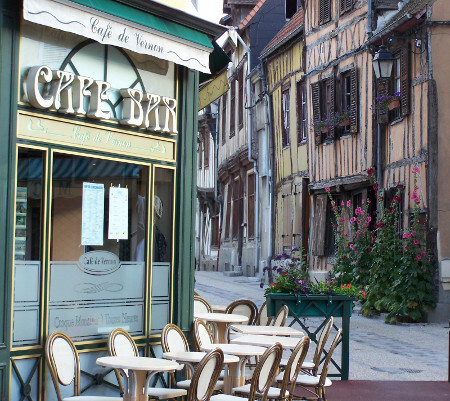 Half timbered houses with ancient doors and carved timbers, shop signs in wrought iron, cobbled paths are of exceptional character and are a frequent sight throughout this charming town. The following streets deserve your attention : rue Bourbon-Penthievre, rue Malauliere, rue Saint-Sauveur, rue du Chapitre, rue Carnot (see the house of the artist A.G. Poulain, richly carved by himself), rue du Pont, rue de la Boucherie, rue Potard (see picture), rue du Grevarin… A map is available at the Tourist Information Office. 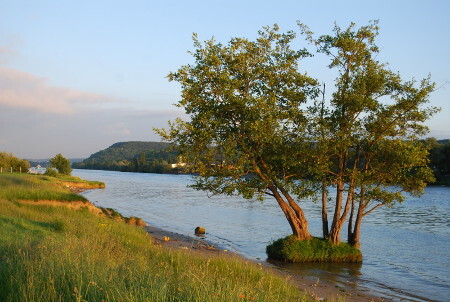 On both sides of the Seine, enjoy a stroll along the water in a preserved natural setting. It’s a nice place where to have a picnic. Живерни (7 км, 0:09) — долгое время здесь жил Клод Моне, можно посетить его дом с марстерской и полюбоваться знаменитым садом, запечатленным на многих шедеврах художника. 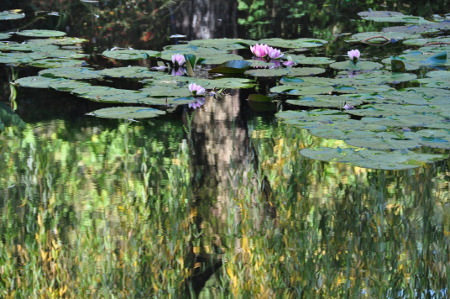 Giverny, with Claude Monet’s house and garden and the Museum of Impressionnisms . Les Andelys is about 20 km away. Fécamp (16 км, 0:25) — великолепное бенедиктинское аббатство, одна из главных достопримечательностей Верхней Нормандии. Здесь делают «бенедиктинский ликер» (Bénédictine) по своему собственному рецепту.